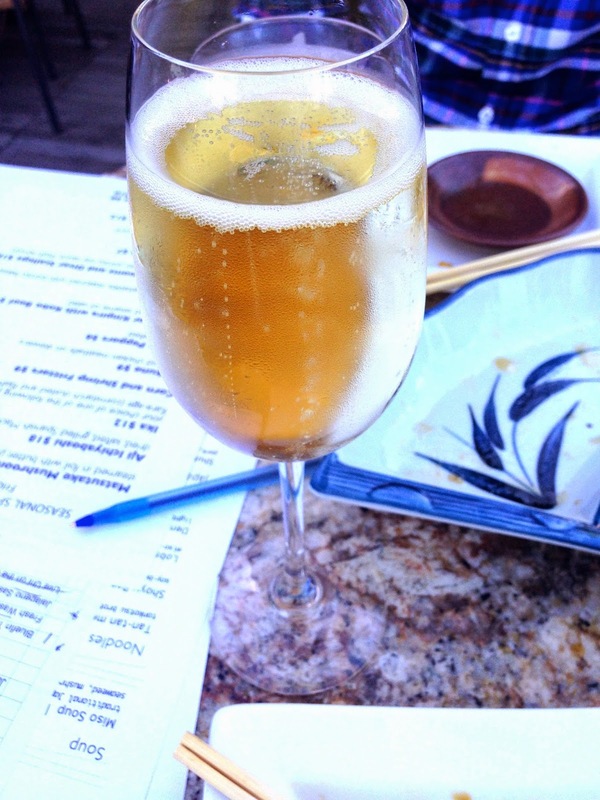 Last week Adam and I ventured to Pearl Street to try out Izakaya Den. Everyone we've come across in Denver has recommended us to this place as the best sushi in Denver and it did not disappoint. The cool part about Izakaya is that it shares a kitchen with Sushi Den, so you can choose what kind of environment you want, but you get the best sushi on both sides. Sushi Den is a little more quaint, while Izakaya Den is a two-story restaurant that kind of feels like you're in a rainforest. Regardless, either place you chose you dine, you will love it. Suggestion; make a reservation! This place was absolutely packed! We started out with cocktails at the bar while we waited for our table to be ready. I went with a Gin Gimlet and Adam, Henricks&tonic. My gin gimlet was delish and I felt so fancy drinking out of a martini glass! When we were sat, we asked the server what he recommended for appetizers. He brought us Japaleno Sashimi with Kanpachi and Pork Gyoza's. 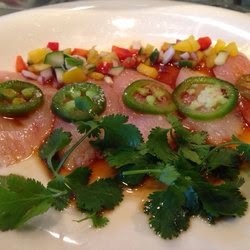 If you like yellowtail hamaci, you will love the Kanpachi, it tastes very similar, and anything with jalapeños is delish to me! 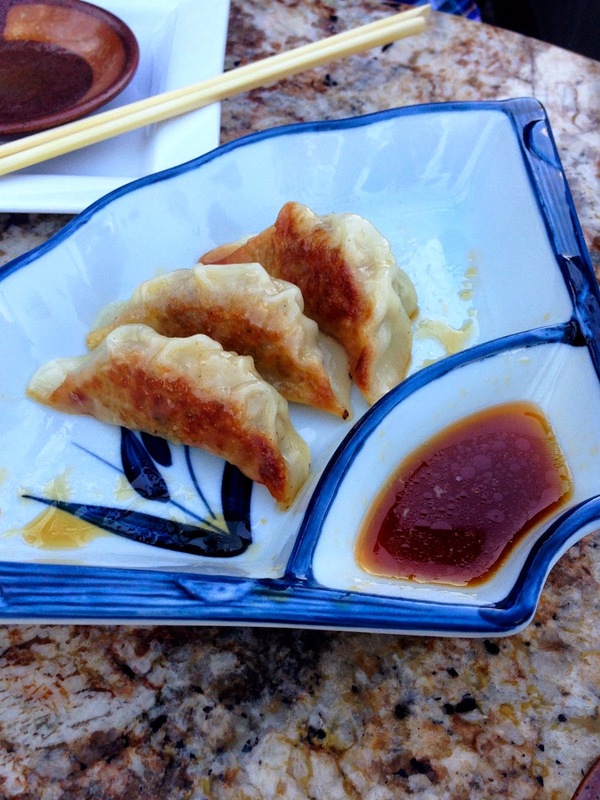 The (pork) Gyoza's were amazing. Crunchy with a little sweetness with the sauce. Boy oh Boy. Then we moved on to some rolls. 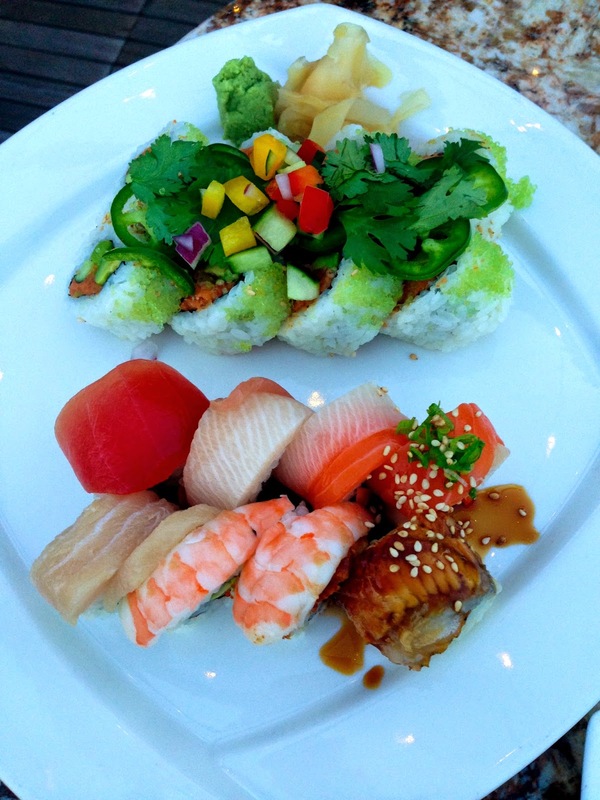 He brought us his favorite and then we ordered a Rainbow Roll and the Firecracker Roll. The cool thing about the restaurant was how knowledgable our server was. He told us about everything in the roll, why it was there and why it was so good. If we went back, we'd totally let our server pick our meal for us. The two things he did pick were the best! This was the one he picked for us. It was the catch of the day. Spicy tuna wrapped in sashimi. Dessert was my favorite because that meant champagne & mochi! 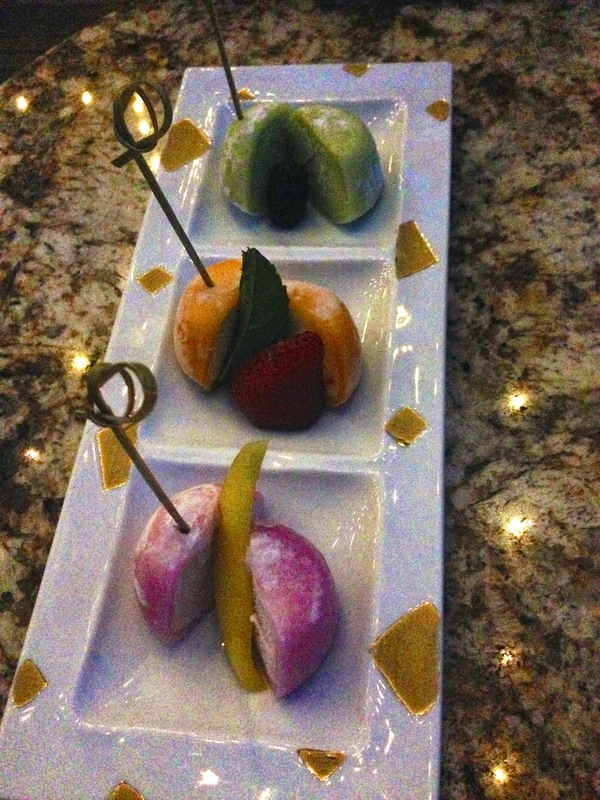 The mochi was mango, raspberry and green tea, and they were my favorite part! This past week marked the anniversary of two of my most favorite shows ever; Friends & Boy Meets World. If you don't like these shows, move along because here are some great moments from both shows. Whitney sent me this 236 seconds of Friends and it is so amazing. 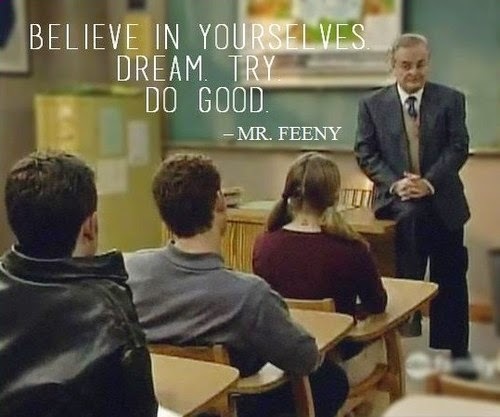 ...And this Mr. Feeny quote, oh boy, cue the tears. It makes me wish I was young again watching this show on TGIFriday. Oh when life was easy and sweet. 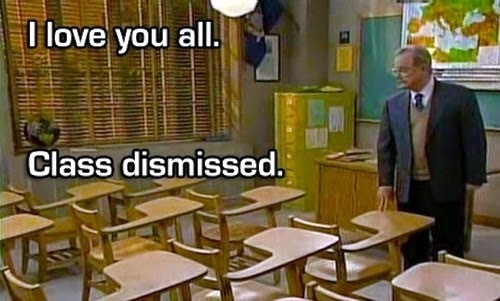 I met Mr. Feeny when I was 8 and it makes me love him even more. I hope these memories make you smile as much they did me. Let's be honest, work weeks are longgg. I started work Monday and have had some kind of activity every night so far. So the last thing I want to do when I get home is cook dinner, do laundry or clean. All I really want is pizza or carryout, wine & I want to sit on the couch with Adam and watch the DVR. Here are my most recent thoughts on paleo/life/newjob&life. Why don't I have a nanny... for me.. that cooks my meals and cleans my house while I'm at work? Thank god there isn't carry out on my drive home from work. Do other people get tired at work between 2 and 3pm? Who is going to invent work clothes as comfy as leggings? I hate the smell of leftovers, in the microwave, when I'm in the break room at work. I wish Henry could go to work with me. I wish it was acceptable to drink a bottle of wine every night because that's what work does to me. What would my manager say if I put a TV in my office? Recipe: Hamburgers with a Sweet Potato Bun. I love hamburgers. With a bun, without a bun, frozen, homemade, In&Out, McDonalds and even Runza. I could eat hamburgers every day. There are times where I have to literally tell myself, "don't eat another hamburger this week, Kristen" It's that bad people and, last night, I knocked it out of the park. I got this recipe from Practical Paleo, and it was probably my favorite thing so far. The title of this post is probably a bit misleading, it's not really a bun, more like a pancake. But, if you're not up for making the bun, the hamburger was so good itself, it doesn't even need the bun. I hope you enjoy as much as we did! Put a thumb print in the middle to make them cook evenly. Heat some coconut oil in a pan and heat to medium heat. Cook the burgers for about 4 1/2 minutes on each side. Eat them, enjoy them and make them again. Look at those fresh jalapeños. Yum. Make sure to give it a good thumb print! In a medium bowl, beat the eggs with the coconut flour, cinnamon and sea salt. Mix in the sweet potatoes until well combined. Add about 2 tablespoons of coconut oil to a large skillet over medium heat. Spoon the mixture into cakes, about 4 inches in diameter. Once they were done, we turned the skillet up to high and let them fry for about another minute on each side to make them nice and crunchy! The key is in the food processor. It was so helpful in getting them nice and small. Combine the potatoes with the egg mixture. As I put them in the skillet, I flattened them with a spatula. Hey everybody, let's work out! Here's your weekly Callie workout session and this is a good one! In my wedding prep, I've been working on my arms a lot, because, lets be real, everyone wants nice toned arms in their dress! If that applies to you, then get ready, because this is a great workout for you! Callie is amazing because she shows you the right and wrong way to do the workouts in this video, which I found SO incredibly helpful. Get ready people, you will be sweating after this one! Thanks again for making all these videos Callie! Ribs. Need I say more? How about a honey-mustard glaze? Are you tastebuds watering yet? I got this recipe from one of my gals, Lynds and I owe her big time. We made these Sunday while watching some football (don't even get me started on the Broncos). We decided to double the recipe so we could have leftovers, and I'm so glad we did! Hard to believe, but they were even better the second day! Put the ribs and the chicken broth in a crockpot. Saute the onion and garlic and then put the whole mixture in the crockpot. Hint: Don't open the crockpot! Keeping Adam away from the crockpot while the ribs were cooking was hard, but don't do it! When the ribs are done, make the honey/mustard mixture and turn the oven on to broiler/high. Put the ribs in a glass baking dish and rub the mixture on the ribs. Broil them for about 6 minutes. Grab some napkins and enjoy! the finished product. the glaze should be nice and bubbly. It's Tuesday, so what does that mean? If you guessed another dessert recipe, you're correct! (Okay, I don't know what one has to do with the other, but desserts rock). This dessert is perfect when you're craving something chocolate and cold. I really really miss peanut butter. I honestly think my next cheat meal might just be multiple spoonfuls of peanut butter. Okay, maybe not, but these little devils are perfect for my craving. They're so good, enjoy peeps! Add a spoonful of the mixture into the 12 muffin tins. [Optional] If I made this again, I would freeze this part (the almond butter mixture) and then add the chocolate. Place the chocolate chips (or cocoa powder/oil) in a bowl and microwave for about 1 minute. Pour the melted chocolate over the almond butter. The reason I would freeze the almond butter before pouring the chocolate over is to help the chocolate spread. When they were both melted and warm, it was just one big gooey mess, but they still turned out delish! Its up to you people, I hope you love them! see what I mean about the gooey (but yummy) mess? Coti, you will LOVE these! Please disregard the peach in the back. Happy Monday! Today is such a big day. Today I started my new job! I am so excited to finally get back into the working world. The last 4 months have been a strange mix between finding my place, taking the bar, looking for jobs and really figuring out what my purpose is. Let's be real, it's been great getting to sleep in, work out whenever I want or nap... But, I went to law school for a reason and I'm so glad I'm finally pursuing my career. What a day. What a great, fun, scary day! 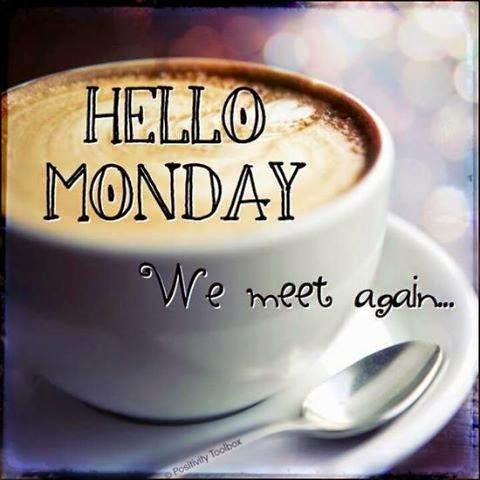 I hope you are all having a wonderful Monday! New recipes coming soon! 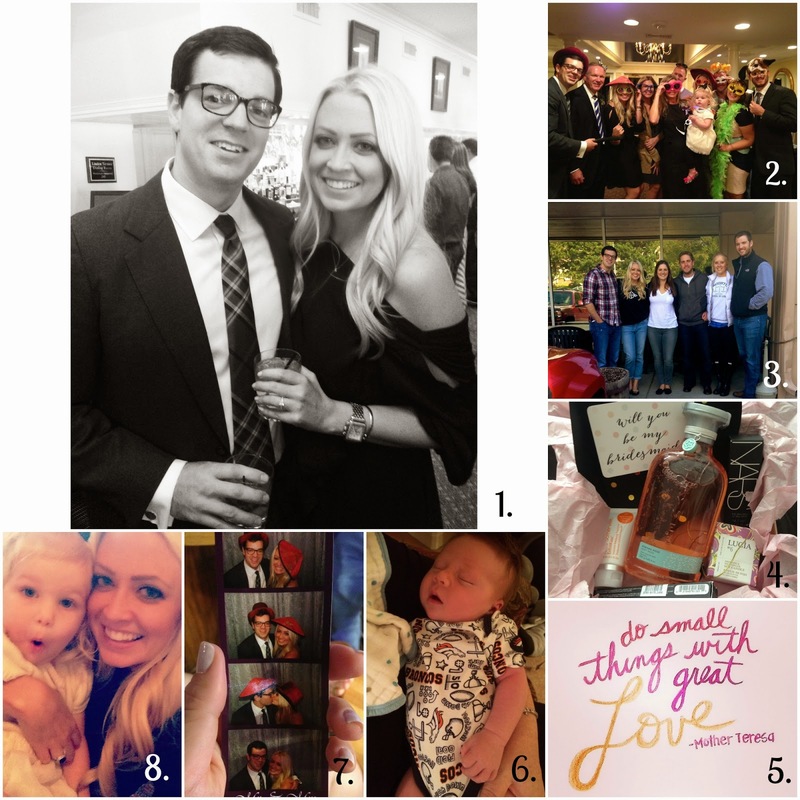 For the last month, I've been trying really hard to stay up on blogging. Some days/weeks are better than others but I'm trying. 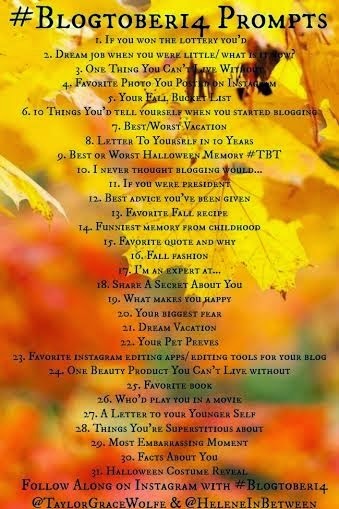 So, when Taylor from The Daily Tay mentioned the Blogtober14 challenge and some inspiration from B, I decided to give it a try! I think it will be a great way for me to stay involved with my blog. But don't worry, I will still be posting all kinds of paleo recipes and stories from Denver! Here are the prompts! I hope you enjoy following along as much as I enjoy writing them! Day 2. Dream job when you were little/ what is it now? This was our latest paleo meal and we knocked it out of the park. Adam told this was his favorite meal I've made, which is a pretty huge compliment. I would eat this again and again. Next time, I might try ground turkey! Enjoy peeps, these are delish! Cut bell peppers in half and place in a roasting dish face down for 10 minutes. I wanted them crunchy, so I only did 10 minutes, but if you want them softer, cook for about 15-17 minutes. While the peppers are cooking, heat the coconut oil in a large skillet over medium-high heat. Saute the onions, add sea salt and black pepper, until translucent (about 4 minutes). Add the tomatoes and garlic to the onions and simmer about 2 minutes. Add the meat and cook until fully done. Now taste it! Does it need more salt or pepper? Mix in the chopped basil. Remove the peppers and flip them over. Spoon the mixture into the peppers. If you want, eat them now! I cooked them for another 15 minutes to brown the meat and to mix all the flavors together. is there anything better than fresh picked basil? I think not. Fresh bell peppers, cut in halves. all the colorful and flavorful veggies. If you want hard, crunchy peppers, leave this step out completely. The finished product. Go devour them now! My favorite (and least favorite) thing about Denver is that every place is new to me. But it's so fun exploring all the different neighborhoods around town and trying all the different restaurants. Last night, my friend Caryn and I ventured to Pearl Street to try out Session Kitchen. Their restaurant motto perfectly captures the atmosphere, cocktails and food served. Sessions are for sharing, globally-inspired, locally sourced and seasonally-influenced, cuisine from vivid iron-clad cookware. Eighteen taps of elevated craft cocktails, elegant beers and esoteric wines, compliment an extensive beverage program designed to awaken every session whether before or after a day well lived. A casual, vibrant, east-meets-west environment enriched by local and international street art provides both the gateway into, and the backdrop for dining, drinking and lingering in three sweeping architectural areas inspired by nature, movement, music, light and art. 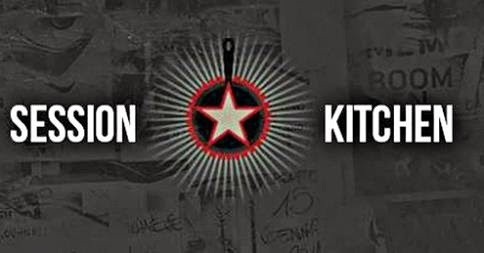 If you live in Denver (or not), I highly recommend Session Kitchen, and if you go, try their version of a Moscow Mule, the Cambodian Mule! It has coconut sake in it, and it is yummy. We decided to take advantage of their happy hour menu and ordered the charcuterie, the olives and pickles and the green beans. So far, everything is so flavorful and delicious. I can't wait to go back and try so much more! The amazing charcuterie. All the meat is house cured and comes with a delicious grilled ciabatta bread & homemade mustard. The house cured olives and pickles. Be careful, those tomatoes in the middle are super hot! Grilled green beans. Yes, that blue cheese is not paleo, but so good! The happy hour menu is so good! Plus they have another huge cocktail menu to go with it! If you're like me, you cook Pork Tenderloin the same way, every time. Well, I wanted to try something different this time, and thought what better than a honey glaze! And boy, oh boy, it was great! Baste the tenderloin with honey. Sprinkle the garlic powder and salt over the tenderloin. Bake in oven for about 20 minutes or until a thermometer says 160 degrees. Broil the tenderloin for about 10 minutes to crisp up the glaze. Costco tenderloin comes two in a pack, and we freeze the other. The finished product! We like ours with some little burnt edges! My best, Coti sent me this today and I think it is such a great reminder. At this current place in my life, it seems perfectly applicable. 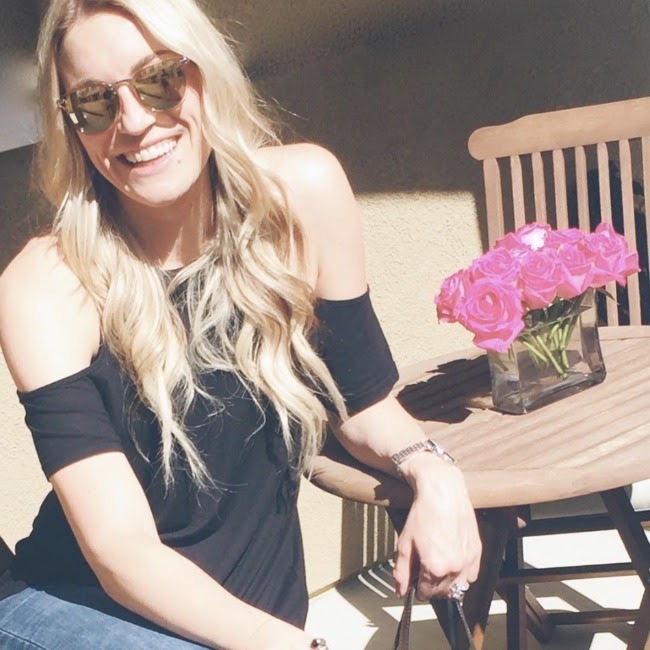 From job searching to paleo, to daily workouts, it applies to my life and gives me peace. I hope it encourages you, like it did me today. Happy Tuesday peeps! It's almost soup season here in Denver. Even though the days are still warm, the nights fall into the high-50's and it makes me crave soup! So, today I made my own version of Chicken Tortilla(less) Soup. It was pretty easy, very spicy and perfect for the cool evening watching football. I know this looks like a long recipe, but I promise it was fairly easy and very good! Cook your chicken. I put the three breasts in a sauté pan covered with water and cooked for 25 minutes on medium heat. But you can cook it however you want, I just think this is a good way to get it nice and tender. Shred the chicken. I use two forks. Season the chicken with the cumin, chili powder, garlic powder, cayenne powder. If you want this less spicy, cut out either the chili powder or the cayenne. In a large dutch oven over medium heat, melt the 2 tablespoons of coconut oil. When hot, add the onions. Let the onions cook for about 4-6 minutes. Add the garlic and the peppers, cook for about 2-3 minutes. Pour in the chicken stock and fire roasted tomatoes and bring to a boil. OPTIONAL STEP: If you want a thicker soup, take out half of the pepper/tomato/onion mix and blend it in a food processor or blender. Add it back. Add the chicken, cilantro and lime juice to the boiling mixture. Serve nice and hot with some avocado on top! The onion/tomato/pepper mixture. Mix it good. Oh life, what a beautiful thing it is! The past couple months have been quite a whirlwind of events. Adam and I have been traveling, visiting friends & family and enjoying being engaged! This last weekend we went to Omaha for a cousins wedding and had such a wonderful time. Here are some pictures of our most recent adventures. 1. Adam & I at his cousin's wedding. 2. Our family clan dressed for the Photo Booth. 3. Breakfast with our closest friends in Omaha. 4. 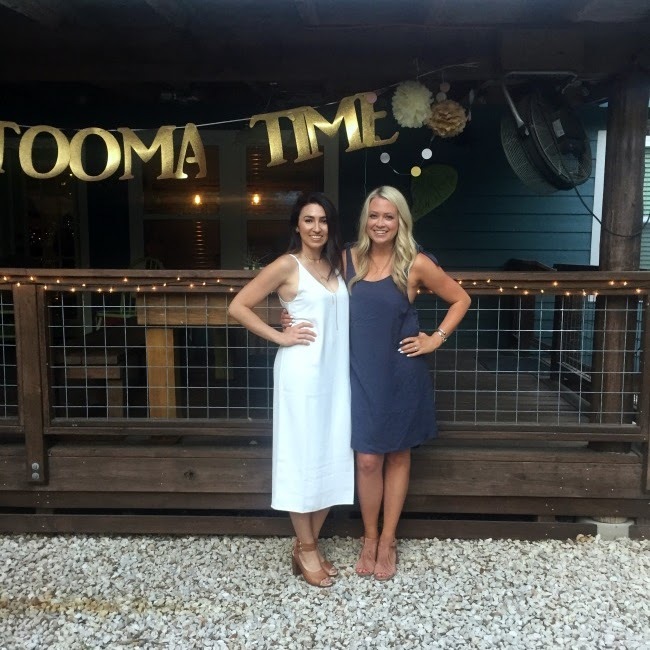 My best friend and maid of honor, Whitney is getting married 2 weeks after Adam and I. It is such a sweet time for us to share together and I personally am loving planning this with her. She just asked me to be her bridesmaid and I couldn't be more honored or more thrilled! 5. A good, constant reminder. 6. My gorgeous nephew Tomás, could he be any more perfect. 7. Adam and I having fun in the photo booth. 8. My beautiful niece Isabel! Quick & Easy Dinner #2! This quick dinner was Adam's idea and boy was it delicious! We got these hamburger patties from Costco. Again people, if you haven't been to Costco, you must go right now. Stop reading this post and go to Costco. These burgers are so incredible, and they're frozen, if you can believe it. They take 4 1/2 minutes on each side and then they're deliciously cooked to medium. Put it all together & enjoy! it was SO delicious and took 15 minutes total! Workout #2! Callie never ceases to amaze me. Like I told you the last time, Callie is a teacher, and a fabulous one at that. Trust me, I've heard the songs she makes up for her classroom and teaches to all her kids. She's the teacher all teachers should aspire to be. On top of being the best teacher, she has time to workout like this, and make videos! She makes these videos for her class and people at her school to help them work out! She's a saint, if you ask me. Go watch her video! I've gotten a lot of questions about the paleo diet. Where do I begin? Can I eat beans? Can you seriously not eat cheese? What do you eat? Are you starving? I'll be honest, I was super skeptical before I started. I had no idea what the diet was about, what it included, excluded or what it really meant. I thought I would always be hungry! It wasn't until Callie began telling me about it, that I fully understood what paleo really meant. I probably wouldn't have ever started paleo if it wasn't for Callie helping me. So I want to help you! So here are my 10 tips for starting the paleo diet. Do some research. Read about it, look it up online, get a cookbook. This diet takes a lot of changes to your pantry, refrigerator and life so take some time before you jump in. You want to make sure what the paleo diet includes is right for your life, right now. Do what's best for you. The paleo diet excludes certain every day foods including granola, oats, quinoa, butter, ect. But if you can't go without granola in the morning, eat granola! Paleo is a diet that should be done 80% of the time, at 100%. 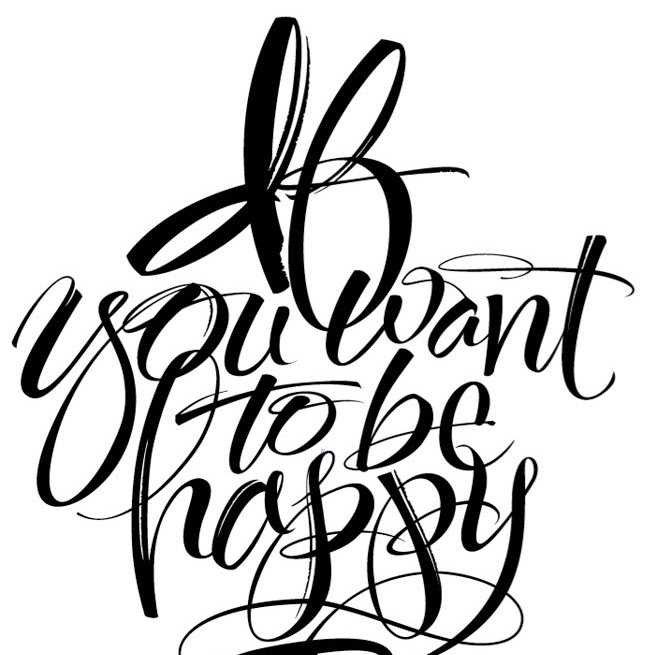 Do what feels good to you! Plan your grocery list ahead of time, aka, meal plan. Paleo requires replacing certain items with new items. Say goodbye to your white flour and replace it with coconut flour and almond flour. Say goodbye to your skim milk, and look forward to delicious almond milk! It's fun, but it requires a long list of new, yummy items! Don't just wander the grocery store or else you will be there for years, wandering the aisles a little lost person. Buy a cookbook. This is my favorite, Practical Paleo. Pinterest is great for getting recipes, but sometimes its hard to have everything online. A book makes cooking so so easy. And its fun to page through all the pretty pictures. Don't be afraid to experiment. A lot of paleo recipes require an adventurous spirit. Cauliflower mashed potatoes might sound gross, but they're actually delish! Don't be afraid to try new things. Seasoning is a huge part of this diet and its so fun to mix different flavors. Sometimes yes, it might turn out bad, but sometimes you'll surprise yourself with something amazing! Have fun with it! Have a cheat day. You will burn out very fast if you never give yourself a cheat day. Trust me, you will miss pizza, pasta, cheese, chinese food (or maybe thats just me). Allow yourself to have a cheat day where you indulge! It will make going back to Paleo the next day feel even better! Remember it might be expensive, but it is worth it in the end. The initially shopping trip might leave you a little shocked. But I promise, once you buy the initial stuff it will get cheaper. Also, go to Costco! They sell huge jars of coconut oil & almond butter, cheap eggs and delicious medjool dates! It will save you money in the long run! Read labels. This diet lifestyle will make you real labels more and understand what exactly you're eating. Have you ever read the label on Siracha? There are so many things in it that I've never actually heard of. It makes you much more aware. 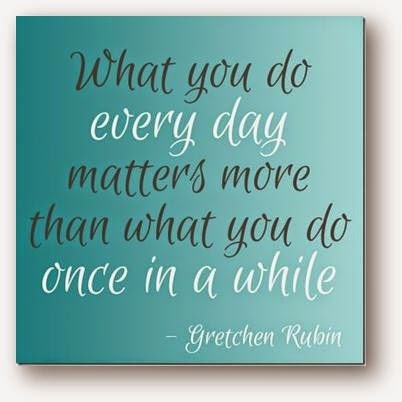 Take it one day at a time. When I first started, I felt great. Then a week later, I got a little tired, a little bored of constantly cooking chicken and just wanted some french bread. A month+ later, I feel great and I'm in the swing of it. I still take it day by day and little by little I get more and more used to it. Paleo is a lifestyle. Get exercise, fresh air, go on walks, drink lots of water. I promise you will feel great! Since I've been eating paleo, exercising has never felt better for me. Make it a lifestyle and you will feel (and see) the rewards! Extra tip, Have fun! This is a fun and challenging change on the way you eat. Enjoy it! Adam and I have a blast looking up new recipes, trying new things and cooking together. I promise you won't regret eating paleo. You'll look great & feel great too! "America was targeted for attack because we're the brightest beacon for freedom and opportunity in the world and noone will keep that light from shining. Today our nation saw evil, the very worst of human nature and we responded with the best of America....Psalm 23, "Even though I was through the valley of the shadow of Death, I will fear no evil for Thou are with me" ...None of us will forget this day, yet we go forward to defend freedom and all that is good and just in our world. May God Bless America." I can still feel the immense anger I felt that day. But more than any of that, was the sadness I felt. It was almost unbearable. I can still feel it today as much as I did on that day, 13 years ago. But the amazing thing, on top of all, is the pride I felt. I've never felt more American pride then I did on that day. I watched a country divided; republican, democrat, white, black, stand together. I saw people helping people, loving people, carrying people, holding people, praying for people. I saw love outshine every ounce of hate. I think that's what GW meant when he said "no one will keep our light from shining." We live in the greatest country in the world and regardless of what people try to destroy, Americans will protect and we will stand up to help each other and fight those who try to dim that light. Tonight, as the minutes tick towards tomorrow, I pray for those hurting and grieving. I pray for the kids, the parents, the spouses of those lost. My heart aches for them. Until I can no longer, I will make sure NO ONE forgets this day. Because it was more than just one day, it was the day America proved how strong it was and how strong her people are. May God Bless you and May God Bless America. When I was in Arizona, my mom and I made this salad and totally botched the dressing. After playing around with it and adding more stuff, it ended up being pretty good, but not what we hoped. I made it again last week and played around with our original recipe and I think I nailed it! If you like thai peanut sauce, then you will love this dressing. Chop all the veggies and put in a huge bowl. It makes a lot, even with a half head of cabbage! Adam's favorite food is mexican. Basically he loves anything with cheese on it, hence paleo makes him kind of sad. But have no fear, last night we made tacos! We made flank steak tacos with tomatoes and sliced red bell pepper. I forgot to buy avocado, weeps. Okay, so here's my thing with flank steak. It's really good, and cooks so easy and fast, but sometimes its a bit chewy. Does anyone else feel that way about flank steak? Okay, lets be real, its really chewy. But it's good, I promise, you should make them. Melt the coconut oil in a medium-high heat. Salt, pepper, cajan season & garlic the steak. Put the steak in the hot oil and cook for 4 minutes on each side, flip and repeat on the other side. In the meantime, cut the tomatoes, avocados & bell peppers & wash the lettuce. When the steak is done, cut it into thin slices. Make your tacos & enjoy!